With her family in Mexico City viewing the video live-streaming from CSU, research student Ms Luisa Perez-Mujica took just three minutes to explain her project on how to deal with the complexity of people's 'mental models' of the world. With her family in Mexico City viewing the video live-streaming from Charles Sturt University (CSU), research student Ms Luisa Perez-Mujica took just three minutes to explain her project on how to deal with the complexity of people's 'mental models' of the world. 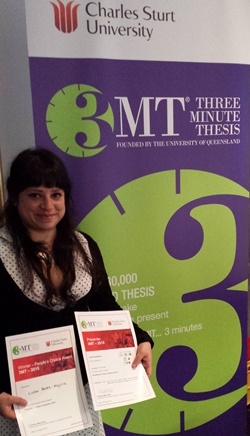 Ms Perez-Mujica won both the Judges' Choice and People's Choice awards at the Three Minute Thesis Competition (3MT) held at CSU in Wagga Wagga on Wednesday 26 August, and will now represent the University at the Trans-Tasman 3MT Final in Brisbane on Friday 2 October. Under the rules of 3MT, the Higher Degree by Research (HDR) students have three minutes to effectively explain their research project in a language appropriate to a non-specialist audience. They are allowed one static PowerPoint slide but no electronic media or props. The competition was developed by the University of Queensland in 2008 and aims to develop postgraduate students' academic presentation and research communication skills. Ms Perez-Mujica is studying people's opinions of the rehabilitation of the Winton Wetlands in north-east Victoria as part of her PhD project on the sustainability of nature-based tourism with a system dynamics approach. "The competition was a great experience, not only to share my research but to practice speaking in public, a very important skill to have as a researcher," Ms Perez-Mujica said. "My friends and colleagues know that speaking slowly and clearly is a big struggle for me. I am very grateful for the guidance and support from my supervisors as they have believed in me every step of the way." In congratulating the eight PhD students for taking part in the event, Executive Dean of the CSU Faculty of Science Professor Tim Wess spoke of the importance of being able to explain their research to a wider audience. In addition to representing CSU in the 3MT finals, Ms Luisa Perez-Mujica won two research travel grants totalling $1 500. Ms Luisa Perez-Mujica is in the School of Environmental Sciences at CSU in Albury-Wodonga. She is a member of CSU's Institute of Land, Water and Society (ILWS). Her PhD, A system dynamics approach to assessing sustainability of tourism in wetlands is being supervised by ILWS Director Professor Max Finlayson and Dr Jonathon Howard from CSU.